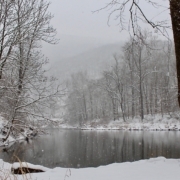 A snowy winter finally arrived along the Cacapon River. The first snow that covers the mountainsides and riverbanks never seems to get old. We love going sledding and building snowmen with our families. But how about shoveling all the heavy snow, or waking up to an ice-covered driveway? Or when the below-zero temperatures kill your car battery?